At Capital our restoration technicians are using the latest thermal imaging cameras to capture changes in temperature as part of our disaster restoration diagnostics. In the thermal image below the darker blue/black the area the colder surface and the more moisture it holds. The lighter the shade (yellow/orange) the higher the surface temperature, indicating that the area is not cold or moist. 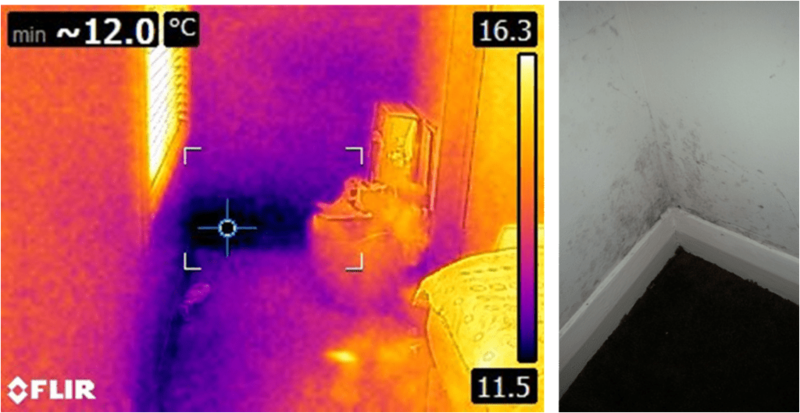 The second photo below shows mould growing in the exact areas the thermal image indicates are moist, indicating that there is a long term water ingress issue that is causing mould growth. By addressing the water ingress issue we can resolve the moisture problem and can then contain the contaminated area to remove the mould damage and treat the contaminated environment. If you suspect mould in your home or business call us on 1300 554 418 and we can undertake a mould damage assessment and/or undertake a mould damage removal and mould damage cleaning program using our professional and certified technicians.